GLOCK confidence: It’s what you carry! Around the world GLOCK is trusted by over 65% of people in the law enforcement profession. One million pistols shipped in 2013. Over 50 models. That’s GLOCK Perfection. The most famous pistol in the world is the GLOCK 17. It was named after the 17th patent that Gaston Glock filed for his pistol design. GLOCK was awarded a contract in 1982 to supply the Austrian Armed Forces with GLOCK 17 pistols. At his kitchen table Mr. Glock started in motion a company that would come to dominate pistol manufacturing and guaranteeing that his name will forever be engraved in the firearms history books. Colonels from the Austrian army said that no man who makes curtain rods for a living could make a pistol to compete with the weapons they had. Determined to show them wrong, Gaston Glock worked in his basement creating his pistol. For each new creation, he would test fire with his left hand so that if it blew up, he could still draw a blueprint with his right. The rest is history. The GLOCK was created in 1982 by curtain-rod manufacturer Gaston Glock. Mr. Glock didn’t like the handguns available on the market and decided to manufacture a new gun from scratch. Before starting, he asked gun experts in his native Austria what could be done to improve a handgun for the modern era. 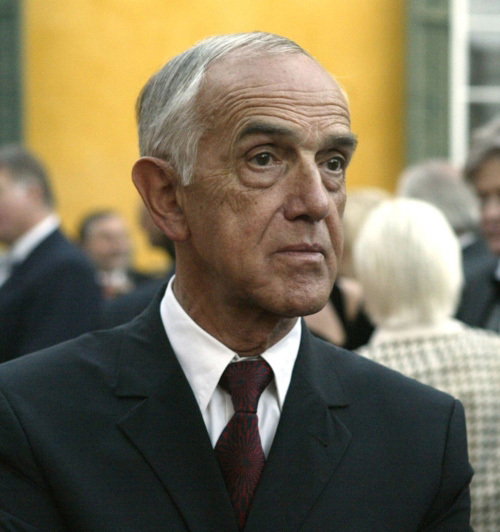 Gaston Glock believed a gun with a much larger ammunition capacity that would be more durable and reliable and easy to fire and easy to learn how to use was needed. He integrated those elements into the GLOCK, and won his first contract with the Austrian army. The model adopted by the Austrian army contained only 36 parts and could hold 17 bullets in its magazine. It didn’t have an external safety like other semiautomatic handguns. It also didn’t have a decocking mechanism. The result? A lightweight, interchangeable model that could be dropped, submerged and subjected to temperature extremes — and still accurately fire. In 1988, the GLOCK made its way to the United States. It was perfect timing, coinciding with the rise of the American drug trade, when many cops were feeling outmanned by gangs on the street. The GLOCK’s large capacity and light body gave it advantages over other guns. Police departments were amazed that their officers could learn to use the GLOCK very quickly. The GLOCK also made them more accurate as marksmen. The GLOCK pistol, sometimes referred to by the manufacturer as a GLOCK “Safe Action” Pistol, is a series of polymer-framed, short recoil operated, locked breech semi-automatic pistols. It entered Austrian military and police service by 1982. Despite initial resistance from the market to accept a “plastic gun” due to durability and reliability concerns, and fears that the pistol would be “invisible” to metal detectors in airports, GLOCK pistols have become the company’s most profitable line of products, commanding 65% of the market share of handguns for United States law enforcement agencies as well as supplying numerous national armed forces and security agencies worldwide. GLOCKS are also popular firearms for civilians involved with recreational/competition shooting, home/self defense and concealed/open carry. The Firearms Industry’s most recognizable and respected icon is R. Lee “The Gunny” Ermey. When it comes to being a “straight shooter,” The Gunny wins every time! Check out the exclusive GLOCK videos. GLOCK’s elite team of shooting professionals competes against the-best-of-the-best in the United States, and around the world. The intense dedication they bring to the sport aligns with the company’s culture of relentlessly pursuing perfection; they compete only with a variety of GLOCK pistols; and their winning records are nothing less than remarkable! Everyone at GLOCK is very proud to have these highly skilled ambassadors represent the company as they travel extensively to competitions throughout the year. But there’s another team GLOCK values tremendously, and that’s the millions of devoted GLOCK owners around the world. If you’re a member of this vast, rapidly growing community, you’re likely to feel a shared kinship, a mutual respect, and the confidence that comes with carrying the pistol that’s always ready to dominate—regardless of your mission.